The Kerrie Show: Happy 6th Birthday, Michael! My sweet, smart, kind Michael is 6 today! He is the long-suffering younger brother to Joel, and he puts up with a lot! I woke on the morning of his birth having some contractions, but they weren’t too bad. We headed to the hospital around 9 or 10, and I was in no pain. Then labor came on heavy (I was dumb and had my water broken to hurry things along), and he was born around 2 p.m. Man, that kid had big lips! He still does, and has huge eyes to go with the luscious lips. His favorite color is orange. His favorite animal is the hippo. He used to say he didn’t want to ever get married, but now he’s changed his mind and has even added kids to the mix! Something very telling about Michael is that he doesn’t want everyone to know his good deeds. We babysat a tiny dog for a week, and Michael jumped up on a chair every time the dog came around. But right before it was time for the dog to go home, Michael HELD it. When I bring it up, he denies it. Also, sometimes I catch him being so sweet and playing with a younger kid. When he sees me watching, he stops doing it! 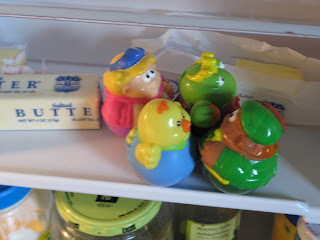 This picture is of his new Weeblz in the butter dish in the fridge. This is the kind of silly thing he does. He’s also quite an artist and makes up his own jigsaw puzzles and rebuses and dot-to-dots. He’s amazing. And I'm not posting a picture of him today because it would drive him nuts.